When do I want to harvest my potatoes? How long do I want to store my potatoes? How important is resistance to disease for you? How do I want to cook the potatoes, chips, roasting, mash etc.? Start to answer those questions and the number of suitable potato varieties will reduce dramatically. Reading our reviews of popular potato varieties will also help you narrow down your search for the perfect potato even further. All the varieties mentioned in the article below can be clicked on for a full a full independent review of their good and bad points. For 2018, we are going to try out a new variety for us, it's called Vitabella, It's a first early and we have heard good reports about it from several gardeners. The UK supplier of seed potatoes for this variety is Patch Seed Potatoes, see here for more details. Alternatively, all the varieties we have reviewed appear in the drop down box below. Simply click on one for the full, detailed review. Whichever potato variety you choose, always, always buy certified, virus free potatoes. Be wary of planting potatoes which are sold in supermarkets and food shops. You will in effect be planting potatoes which are not certified virus / disease free and you stand a chance spreading disease into your garden and this will stay there for several years. We advise that you only use certified seed potatoes. Potato varieties which are known to be resistant to specific pests and disease are listed below. Note that no potato variety is 100% resistant to any pest or disease but the ones listed below increase your chances of succes significantly. Early (new) varieties of potato can be harvested earlier compared to maincrop potato varieties. There are three key types of potatoes, first early, second early and maincrop. First early seed potatoes take around 80 days after planting to mature and should be ready to start harvesting in mid June 2017 in average areas of the UK. the Swift variety is the quickest of all to mature taking 70 days or slightly less. Second earlies take around 100 days after planting to mature and will be harvestable around mid July 2017. Maincrops mature latest, taking around 130 days to mature in early to mid August 2017. The harvesting period from start to end is about six weeks and the start harvest date will vary according to weather conditions. Most early varieties of potato do not store well so eat them as they are harvested, but see the remarks below about the variety Jazzy. Many maincrop potatoes do store well, some for several months in the correct conditions. If your primary concern is good storage abilities then the varieties below will not disappoint. 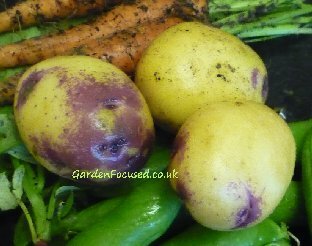 Jazzy is a second early which stores astonishingly well when grown in potato bags to avoid slug damage. Harvest as early potatoes whenever required. The ones left in the bags, in our personal experience, will last up to early December or the first frosts. By that time they are no longer earlies but they are maincrop which mash, chip and roast very well. Click here to read how to harvest and store potatoes for the longest lasting crop. When it comes to taste and cooking no two potatoes are the same. The primary differences between potatoes, as far as cooking is concerned, are the water content and the density of the potato. Taste obviously is important but if you cook a potato in a manner that doesn't suit it then it will always be a disappointment. We make some recommendations below for the various methods of cooking potatoes but local soil and weather conditions will alter the taste of potatoes. Don't get too hung up about choosing a particular recommended variety just make sure that it suitable for the cooking method that is important for you. As a general rule, early potatoes are the ones to choose if boiled new potatoes are required, for eating both warm or in salads. Some maincrop potatoes can also be used for this purpose but the earlies will always out perform them in this area. First / second earlies which we recommend for boiling as new potatoes include Arran Pilot, Jazzy, Nicola, Charlotte, Lady Christl, Vitabella and Anya. As a novelty the International Kidney variety (sometimes called the Jersey Royal) will not disappoint as a boiled new / salad potato. This variety can be left in the ground for a month or two to be harvested as a maincrop. Pink Fir Apple also have excellent taste. Here we are talking about boiling potatoes which are not new. This cooking method seems to have gone out of fashion a bit, the majority of people seem to mash potatoes after boiling. But correctly cooked boiled potatoes are a treat. Maincrop potatoes and second earlies are best for boiling although Red Duke of York (first early) boils exceptionally well. Nadine, Kestrel, Maris Peer, Estima and Wilja are excellent second earlies for boiling. From the maincrop potatoes, King Edward, Maris Piper, Maxine, Arran Victory (steaming) and Celine are favourites. Floury potatoes are often deemed "unsuitable for boiling" by UK based websites. The trick to boiling them is to check them frequently and pour away the boiling water as soon as the skins have begun to crack. Turn down the heat to minimum and keep lid on tight to allow spuds to steam until soft in middle. Voila: lovely, floury spuds that have not disintegrated into starch solution. Aside from salad potatoes, potatoes for baking are the most critical as far as variety is concerned. You need a largish potato which cooks evenly and ends up retaining it's shape but soft. Maris Piper, Maxine, Maris Peer and Nadine all make excellent baked potatoes. King Edward have a delicious taste and texture although they can be slightly on the small side. Kestrel and Wilja make excellent second earlies for mash. Vivaldi is reputed to have a smoother texture for mash compared to most varieties. From the maincrop varieties, Arran Victory, King Edward and Maris Piper are top class. 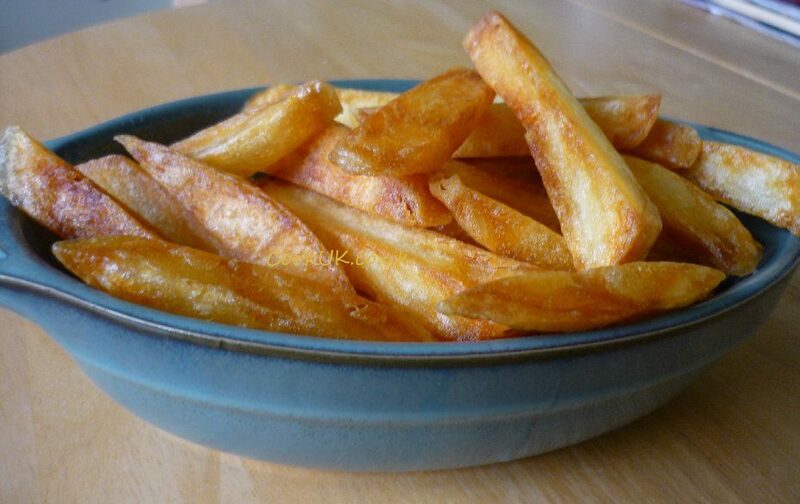 Which variety is best for chips is perhaps the most contentious of all the cooking questions Gordon Ramsey is fully in favour of Desiree - King Edward and Maris Piper are also top class for this use. For the best chip you are looking for a relatively dry potato which fluffs up well inside the chip but crisps up on the outside. In the end however, whatever this or that celebrity chef says, the majority of fish and chip shops cook the Maris Piper - they are the true professionals and they know best! Many varieties of potatoes are good for roasting, in our opinion King Edward is the best. Other varieties which are well known to us as top quality roasters are Kerr's Pink, Arran Victory and Sarpo Axona. As with all the types of cooking potatoes, the cooking method is important. We know a thing or two about cooking, having produced the website CookUK.co.uk and over 400 recipes. We never got round to publishing the perfect recipe for roast potatoes but Mel and Mal's recipe which can be found here is our guide every time. Forget the fact that they use a halogen oven (it's irrelevant) and don't worry too much about the fat being goose fat. The method used is perfect for us so give it a try. Choosing a potato variety to plant is very personal and depends on a lot of factors. We believe that the varieties listed below are unlikely to please most people but remember, it is only our own opinion. Good disease resistance but lacks flavour, does not boil well at all in our experience. See our full review of Cara here. Far too watery and lacks flavour, but often used for exhibition purposes. Another well known exhibition variety is Amour. Produces potatoes very early but lack taste. Swift is a far better choice in every respect. It's quite common now for seed potatoes to be sold in late summer with the promise of a crop ready for your Christmas lunch. We live in the Midlands in a slightly cooler than average UK climate and have indeed sown seed potatoes in mid to late August which gave us a good crop. The catch though is that very few will be around for Christmas. What happens is that the soil is so warm in mid to late August that the seed potatoes sprout at a very quick rate and, given you choose a suitable variety, bulk up quickly and ready for harvest in late October. The foliage is then likely to be caught by a frost so it's best to cut it away - remember to mark where your potatoes are in the ground because in a week or so there will be no trace of them above ground. We generally harvest those potatoes from very late October through to Christmas day (just for the fun) by which time very few will remain. You will be limited to a small select band of seed potatoes available at this time of year, there is not a huge choice for sale. We would recommend Nicola, Charlotte or Maris Peer.